Product selection and listing optimization are just the beginning of finding success on Amazon. Without traffic, you could have the best product in the world, but no one would know. That’s why there are so many tools to help sellers craft the perfect strategy to get customers to their listing and, ultimately, to purchase their product. Advertising can help drive traffic to your listing, and as Amazon has evolved as a marketplace, they’ve introduced many different advertising options. As a third-party seller, your main advertising campaign options are Sponsored Products and Sponsored Brands. Sponsored Brands is currently only available to sellers enrolled in Amazon Brand Registry. This campaign option allows sellers to promote their brand and products through banner ads at the top, side, and bottom of the search results page. Sponsored Brand advertising allows more freedom and flexibility than Sponsored Products. Through Sponsored Brands, you can create a customized ad focused on a specific product, or promote your brand as a whole. 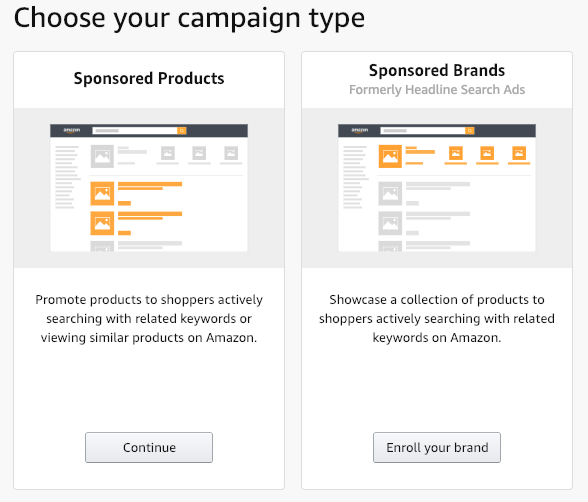 As you can see from Amazon’s example above, there are a variety of options, and you can always run more than one campaign at once and see which is more successful! These ads are powered by keywords. Keyword research for listing optimization and advertising are very similar. However, it’s important to pay attention to each advertising report individually to determine which keywords to bid on in each campaign. For example, let’s say that you’re running two ad campaigns. One is focused on a new product you’re releasing while the other is centered on your brand. When looking at your advertising report you might find that your brand ad has a higher conversion rate on top-of-the-funnel keywords while your product ad has a better click through and conversion rate with long tail search terms and vice versa. The other advertising option is known as Sponsored Products. Sponsored Products ads appear on the first page of search results and product pages, providing an instant visibility boost for your product listing. If you aren’t part of Amazon’s Brand Registry, this is the only Amazon advertising option available to you. A seller can run a Sponsored Product campaign on any product within their Seller Central inventory. There is one catch: your listing must have the Buy Box in to run a campaign. If you have the Buy Box at the start of a campaign but lose your position during the campaign, it will pause until you’ve captured it once again. Both Sponsored Products and Sponsored Brands are pay-per-click (PPC) ads, meaning that you only pay Amazon when someone clicks on your ad. These ads are based on an auction-based model, meaning the highest bidder will “win” the keyword. The cost per click depends on how much you bid on that keyword or product. These bids can range from two cents to several dollars. In general, top-of-the-funnel keywords require higher bids than long tail keywords. Best practices are to set the maximum cost-per-click to the highest amount you are willing to pay. This way you increase your chances of winning the keyword but don’t exceed your advertising budget. Sound complicated? Don’t worry, even Amazon experts find PPC daunting sometimes. We’ve broken PPC down to its basic parts to help everyone learn, whether you’re at the start of your Amazon journey or have an already booming business. First, there are two different types of PPC campaigns: automatic and manual. As the name suggests, Automatic Sponsored Product campaigns require very little upfront work. You select which product you want to promote and set your daily budget. That’s it. Amazon does the heavy lifting for you and chooses which keywords display your ad and where your ad is displayed. Close Match: These are keywords that are closely related to the product that you’re advertising. For example, if you’re selling athletic shoes, “running shoes” would be a close match. Loose Match: These are keywords that are loosely related to your product. Using our previous example, “sneakers” would be a loose match. Complement: This is based on your product. Under this category, Amazon will display your ad on products that are sold separately from yours but are frequently used together. For example, your athletic shoes might appear on a listing for running socks. Substitute: Substitution is also product-based. In this section, Amazon promotes your products alongside listings where your product could replace the non-sponsored listing’s product. Your athletic shoes might appear on the product page of your competitor. When running an automatic campaign, you will not be able to choose the specific keywords or products where your ad will appear. Amazon will be selecting this information for you. You will receive a report from Amazon with detailed information about your campaign performance. This report shows how many impressions your ad received and which search terms displayed your ad. This report will also tell you the number of clicks your ad received per keyword and how many clicks converted into a sale. These metrics can help you determine how to change your keyword bids, it can also help inform your keyword selection for your manual campaigns. While this information is available after twelve hours, we recommend waiting a week before changing your bids or strategies to gather more data and a more accurate picture of your campaign’s effectiveness. A Manual Sponsored Product campaign requires a more hands-on approach. In addition to picking the product you want to advertise and your budget, you’re responsible for choosing the keywords or products that you would like to display your listing ad. You also have more flexibility and control over how you bid, as explained in the next sections. After you’ve determined your campaign budget, you can adjust the bidding structure for your campaign. Start by looking at your campaign budget and determining what you want your daily spend to be. Then decide which type of bidding best suits your needs. Dynamic bids (down): Amazon will automatically choose to lower your bid when it determines your ad is less likely to convert into a sale. Dynamic bids (up and down): This option will allow Amazon to either raise or lower your bid up to 100% when Amazon predicts a sale is more or less likely. Fixed bids: True to its name, this option keeps your bids the same unless you log in and manually change them. If you go with this option, we recommend checking in at least once a week to monitor how your chosen keywords or products are performing. Next, you must decide if you would like your campaign to be keyword-targeted or product-targeted. Keyword targeting: This is the more traditional form of advertising. Amazon provides a list of recommended keywords based on your product. If this is an existing product, you’ve likely already performed keyword research, and you should use your tried-and-true keywords here. If you haven’t developed a keyword list, we’ve put together some tips to help you out. You can also use a reverse ASIN tool like ASIN Plus to see which keywords your competitors are ranking for on page one search results. Amazon also provides you with options based on the products you have selected. Product targeting: One of the latest additions to Sponsored Products advertising is product targeting, which allows for more control over where your product will be displayed. Rather than selecting keywords, you can center your campaign on a specific category or individual products (ASIN). 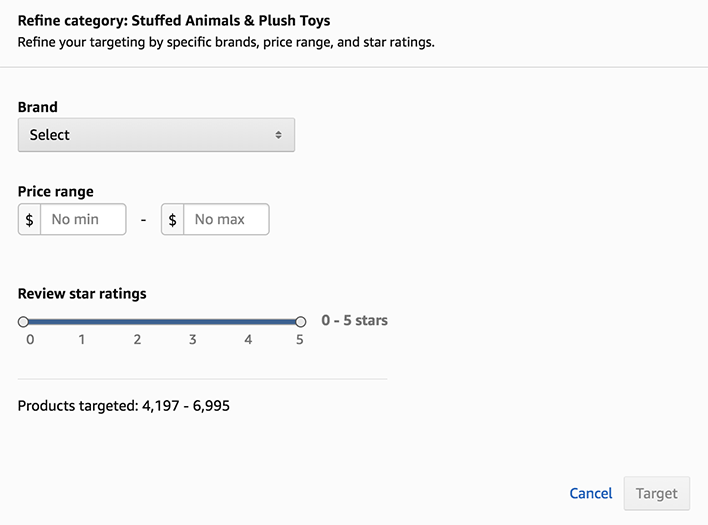 You can then further refine your search by brand, price range, and review star ratings. This latest feature allows sellers to pinpoint exactly which brands they would like their advertisements to appear on. As bidding for top-of-the-funnel keywords has always been competitive, (i.e., “expensive”), this new feature allows smaller sellers to earn potential traffic from searches for similar brand-name products. Amazon Sponsored Advertising can help you get customer eyes on your products, and it’s a great way to increase brand awareness and sales. Get the latest Amazon news and insights by visiting the MerchantWords blog, following us on Twitter, Facebook, and YouTube or by signing up for our mailing list! DISCOVER, OPTIMIZE, AND GROW YOUR BUSINESS WITH MERCHANTWORDS.